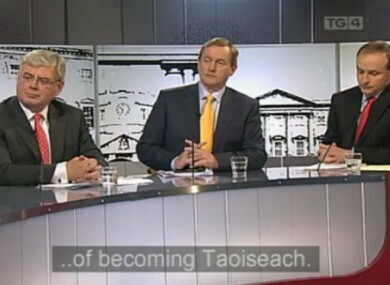 Eamon Gilmore, Enda Kenny and Micheál Martin take part in the first of their two three-way leaders’ debates on TG4. Eamon Gilmore, Enda Kenny and Micheál Martin were sat in alphabetical order for this evening's TG4 debate. THE LEADERS of Ireland’s three main political parties have taken part in their first ever three-way pre-election debate, through the Irish language on TG4. In a pre-recorded debate moderated by Eimear Ní Chonaola, the leaders – Eamon Gilmore, Enda Kenny and Micheál Martin – discussed plans for the future of the Irish language, promoting tourism in the regions and job creation in Gaeltacht areas. The wide-ranging debate – which had been recorded this morning, so that English-language subtitles could be carried on-screen – also included extensive discussion on European policies on agriculture and fishing – industries which provide significant employment in the country’s Gaeltacht areas. Fine Gael leader Kenny came under fire for his party’s plans to remove Irish as an obligatory subject for the Leaving Certificate, but defended himself by saying such a move would only take place after his party had overseen reform of the Irish language curriculum to ensure that it was spoken to a greater proficiency by more school-leavers. Micheál Martin insisted, however, that the FG policies would result in the “gradual death” of the language, while Eamon Gilmore said Irish was no different to English or Maths, with all three needing curricular reform. Discussions on tourism saw the leaders clash over whether airlines should be subsidised in order to fly to regional airports, while other discussions centred on whether Ireland should seek specific amendments to the European Union’s common agricultural and fisheries policies. In debate on the country’s economy, Kenny said it was through Fianna Fáil “stupidity” that Ireland had found itself in such a precarious fiscal situation, having invested €100bn into the country’s banks, including €35bn into Anglo Irish Bank. Gilmore added that the current government’s banking policies had “destroyed” the country, while Martin said his party’s economic plan provided a coherent path to economic recovery. The debate closed with Ní Chonaola asking each leader where, if their respective counties were playing in the All-Ireland finals, they would feature on the team: Kenny offered that he would be “all over the pitch” as his team captain, while Martin would be in midfield “to take control of the game”. Eamon Gilmore – who said he would represent his native Galway instead of Dublin, where he serves as a TD – would play in goal, because that way he would usually get to wear a red jersey, and because he would get to wear the number 1. Email “Leaders debate Irish, jobs and agriculture in TG4 debate”. Feedback on “Leaders debate Irish, jobs and agriculture in TG4 debate”.